Obsessed with rare books and other ancient data. 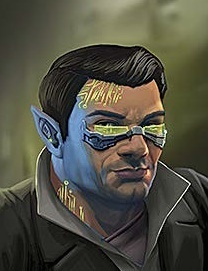 Barnaby Rudd is an Australian-born male dwarf, aged 38, and a technomancer. He has been running the shadows ever since crash 2.0. He has a lifelong pursuit of rare and ancient books and manuscripts. He speaks many dead languages, but only English in terms of living ones. He would love to ultimately discover who was behind the VITAS outbreak in his town when he was young, but his thirst for knowledge has spread beyond this personal goal. He knows that the truth of the world is far more complicated than his own personal mystery. He will frequently put the ancient secret knowledge he discovers into the resonance realms, in hopes that he will learn other secrets there in exchange. Has a business providing forged ID’s to runners and neo-A’s, with Sem-par and SYD. Barnaby Rudd was always small, and usually sickly. While his schoolmates in the small town outside of Alice Springs would play rugby, Barnaby preferred to sit in the shade of a gum tree, reading old books, and occasionally sneezing due to his many allergies. In some ways, his UGE at age 13 was a blessing: as he slowly became more dwarf-like, some of the long-standing allergies that he had disappeared. That, and the boys would never tease him for not playing rugby. (Unfortunately, the sudden reshaping of his face combined with thick glasses left him with a somewhat unusual appearance, leaving him with the fairly permanent moniker “wombat”, which he embraced. Apparently he was willing to believe that it was something of an honor, though, to be sure, this was not the case. Kids can be so cruel.) All through his puberty, he was in and out of intensive care due to his ill health, which only served to distance him further from his peers, and drive him deeper into the books that he craved. While his classmates would, on occasion, get a metaphor or two from an assigned reading, Barnaby would practically be able to smell what the characters smelt, and feel the deep emotions that they felt, even when it wasn’t expressly written. His teachers liked his unique perspective, but it was difficult to teach a child that was, more often than not, in the intensive care ward of the local hospital. There was one bout of illness that was particularly severe, however, and Barnaby was forced to remain in a completely sealed chamber for months at a time. It was feared that any exposure to outside germs could absolutely destroy his still-growing system. Barnaby made the best of it, though he was still well aware of the taunts of his peers on social media sites, claiming that “Wombat was a broken dwarf, being sick when others were so hardy, and that he was merely pretending to be smart by surrounding himself with books because he could never get a girl.” Kids can be so cruel. One day during this long stay in his isolette, he saw some doctors and nurses rushing down the corridor. This in and of itself was nothing out of the ordinary, and Barnaby busied himself again reading the works of Pliny the Elder. He was only concerned that whatever the emergency was, it would delay his pudding for the day. The snack time came and went, however, and the nice (though fairly unattractive, he thought) orderly that usually brought him his snack never arrived. Barnaby was somewhat irked, and eventually fell asleep reading. When he awoke, dawn’s rays were filtering through the window. Still, though, it was apparent that the nurse had not been there. He buzzed for her, but there was no response. He turned his attention to the local matrix, thinking that it was perhaps a large accident that was clearly taking the attentions of the staff, but there was nothing but static. Barnaby was worried now, and began pounding on the door of his isolette, shouting for a response. Three days later, a mostly dehydrated Barnaby Rudd was rescued by a joint UN/Australian emergency task force. He was one of only a handful of survivors of a sudden VITAS outbreak that seemed entirely localized within his town. The task force had no answers for Barnaby, and official reports were kept to a minimum to “prevent global panic”, as it seemed like an isolated incident. Barnaby inherited his parent’s somewhat limited wealth, the bulk of which came from a cheap sale of the family home. No one really wanted to buy a house in a ghost town. Barnaby wandered through Europe and North America for quite some time, getting more and more convinced that what happened in his town was the result of some sort of vast conspiracy. Some corp, or dragon, or government, or ancient elf had been testing VITAS. He was sure of it. His whole town was merely an acceptable loss. Barnaby began to look deeper into the history of a variety of power players, and came across some ancient tomes that seemed like they could possibly be referencing some individuals and entities that may still be around today. He studied ancient languages, and sought rare books and artifacts. He taught himself some forgery, to better avoid being duped by fakes, which was certainly an expensive lesson. While still occasionally troubled by his sickness, he’d discovered a fairly cheap inhaler that mostly did the trick, so he could act naturally at a moment’s notice. Barnaby began to see his future laid out before him: tracing old books, discovering secrets, and perhaps one day learning who killed his childhood. But fate had other plans. While Barnaby was in New Orleans, doing some matrix research on the diary of a 16th century French monk that he’d recently acquired, Winternight executed their deadly and insane plans. Barnaby tried to jack out, but the commands would not work. He tried to physically remove the trodes from his head, but he was completely paralyzed. He watched in horror as the very matrix began to change around him, diseased and unnatural, but at the same time liberated and almost of nature. Barnaby found that he suddenly had an intense connection with the matrix, in a way that made no sense whatsoever. Sure, he could see things how they were before, if he wanted, but he could also see behind the data. He could see the truth, the hidden meaning in things. He could find holes to peer through, and new avenues to explore. Furthermore, he could mold the matrix like clay, and he could breathe life into this clay, and it would do his bidding. The very matrix could be a golem, he felt, like in the ancient Hebraic and Aramaic accounts that he’d read. And he was the one that could breath life into it. Well, he was one of the ones. Barnaby learned quickly that he was not alone, and that his newfound abilities were highly prized. Setting aside his pursuit of the rare and outre for the moment, he dedicated his life toward becoming a world-class technomancer. This way would lie information, and this way would lie power. He would discover secrets again, certainly. But he would learn so much more because everything was hidden on the matrix, and nothing was hidden from him there. It was only a matter of finding it. So, Barnaby’s lifelong search for ancient and hidden knowledge continues, though now he is considerably more well-equipped to do so.